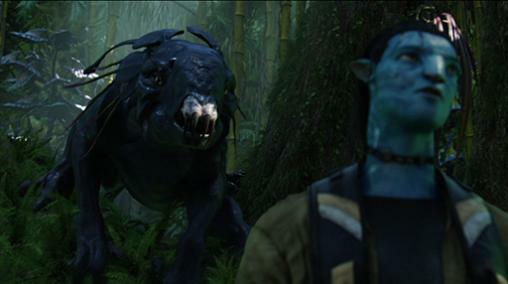 Thanator | Pandorapedia: The Official Guide to Pandora | Own AVATAR on Blu-ray & DVD Now! Its musculature is pronounced and impressive, providing power for protracted runs and leaps. The speed of its neck and jaw strike is as swift as a camera shutter. In addition to conventional ripping and tearing, the thanator can also deliver a lethal blow from its armored tail. The thanator's senses are so highly developed that, depending on atmospheric conditions, it can detect prey up to thirteen kilometers away. The thanator appears to hunt alone and normally does not stray outside of its territory, which is believed to be roughly 300 square kilometers. It appears to hunt mainly at night, although seems to make an exception if hungry enough. Surprisingly, the thanator has ten sensory quills, two each sprouting from armor plating that encircles the rear of the skull. The function of the quills is poorly understood, but it has been hypothesized that they may be tied to an internal mechanism of prey location. Habitat Rainforest floor. Similar species have been observed in subarctic regions. Anatomy Armored head and massive distensible armored jaw. Teeth are twenty-three centimeters long. Burnished black skin banded with stripes of yellow and scarlet. Ten external sensory quills. Upper lips fold back for maximum tooth extension. Armored chitinous plating over dorsal area. Feeding Ecology Apex land predator, omnivore with preference for nocturnal hunting. Size Reaches more than 5.5. meters long, up to 2.5 meters tall. Notes The most fearsome of all Pandoran land predators. Wide, armored tail can slam prey or defend against other thanators. Cartilaginous plates around its neck that can flare, possibly as a threat display but more likely as an echolocation or other sensory pinpointing system. Given its anatomy, it is likely that thanator is evolutionary relative to the viperwolf.